Blockstack is an open source initiative that implements a distributed global naming system on top of the bitcoin network. The system allows users to pseudonymously buy and own identifiers similar to the domain name system. While payment and proof of ownership is running on the public bitcoin blockchain the metadata for registered identities is managed on a separate distributed and open p2p network based on open source software developed by the blockstack community. Metadata is stored in full redundancy. The system is running as sidechain to the bitcoin livenet and already has about 69967 registered “domains” in their top level namespace “.id”. Name registrations have an expiry that is given in terms of block height. Our test registration was registered at block 455211 and will expire at block 560401 if not updated. 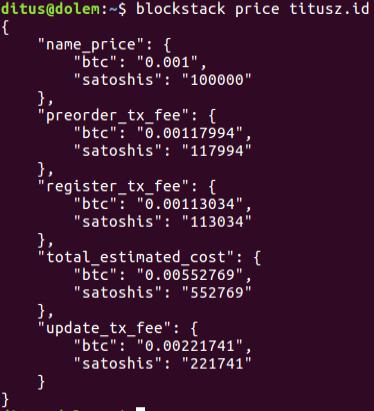 So our registration is valid for about 105190 bitcoin blocks at ~10 minutes each which adds up to 730 days (2 years). While it was interesting to test and see how Blockstack solves the name registry problem, ultimately the concept of exclusive and “first come, first served” name ownership is too restricted to fit our broader needs. The costs for registering a name are too high for our intended use cases and are likely to increase with bitcoin’s popularity. So we did not proceed with a deeper testing of available metadata storage options.